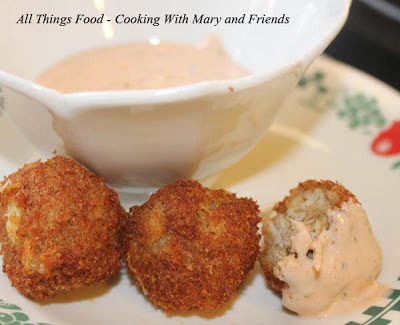 I love seafood of all kinds, so it didn't take much convincing for me to try to make these little appetizer crab balls. Simple recipe, easy to do, and they taste fantastic! Love the combination of the Old Bay seasoning with the crab meat, and the mayonnaise is just enough to bind them together. Light, fluffy, delicious! Mix first 3 ingredients together; gently fold in crab meat and shape into small balls. Fry in oil in a heavy skillet (or deep fryer) for a few minutes, or until evenly browned. Drain on paper towels. Serve with Remoulade Sauce. Mix all ingredients together until well blended; chill several hours in the refrigerator. Serve chilled with crab balls, crab cakes, shrimp or any seafood you want to.